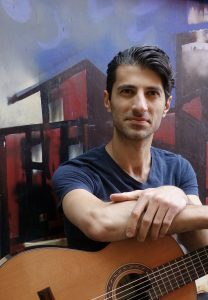 Award-winning guitarist Naeim Rahmani has performed throughout the US and internationally. His performance venues have included everything from a renovated industrial space in Oaxaca, Mexico, ancient churches along the Camino Santiago in Spain, and arthouses in Berlin. In all of these places Naeim brings his deeply personal style to create an intimate musical experience for the audience. Naeim is an experienced teacher. He trained under renowned Cuban guitarist Rene Izquierdo at the University of Wisconsin where he received his M.M. degree. He has taught at the University of Wisconsin, Maranatha University and at the Latino Arts Strings Program in Milwaukee, a non-profit organization dedicated to encouraging the artistic development of youth in the community. Naeim is thrilled to be part of the music faculty at Bellevue College and looks forward to working with both students and faculty.